With Marcus Mariota leaving, the question now presented to us is who will be the next QB for the Oregon Ducks. While it’s true Oregon has some intriguing options in-house, Jeff Lockie and Morgan Mahalak in particular, the one guy who could be at the same stature of Mariota was on the opposite sideline during the CFP National Championship Game. This man of course is Braxton Miller, the one-time Heisman contender who lost his job to J.T. Barrett and Cardale Jones after being injured. With his future at Ohio State in question, and a transfer to another university likely, why not Oregon? 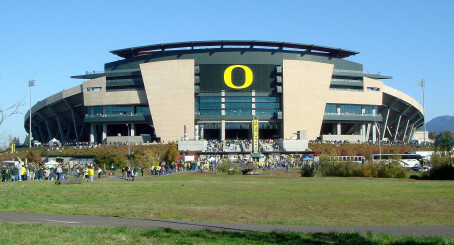 Could Autzen Stadium be Braxton Miller’s new home? While everyone keeps talking about Miller transferring to either Florida State or LSU, the fact is Oregon would be a better fit than either of them. Miller has never played in a “Pro Style Offense” such as FSU or LSU and would be a much more natural fit in Eugene running the Spread. On top of the natural fit, imagine an offense boasting Miller, Royce Freeman and Byron Marshall all on the field at the same time. It just makes perfect sense for Oregon. From Miller’s point of view, why go somewhere to learn a whole new offense or stay at OSU where he’ll have to fight two very good QBs for his job when he can come to Oregon and essentially take the job, running a very similar offense. At Oregon he would have the opportunity not only to win a championship, but potentially win a Heisman trophy and, perhaps more importantly, become a top NFL draft pick. While it may not happen, it could be a perfect match for both Miller and the Oregon Ducks, creating a team that would have the potential to be better than the one that just played in the championship game.